Sandy soil 800 ml per acre, Black soil 1 lit per acre. Pendiclean usage helps to avoid competition between plants and weeds or nutrients because weeds are not able to come out. Pendiclean control weeds initially so insects and disease population automatically reduce and which result better yield. 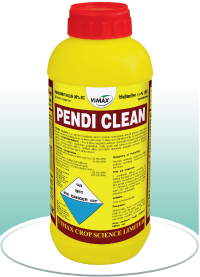 Pendiclean usage is before crops and weeds germination so it is safe to crops. Very well prepare land for crop sowing. After sowing and irrigation apply pendiclean spray within two days. Use flat fen or flood jet nozzle for pendiclean application. Use 200 lit water in one acre land. 500 ml, 1 lit, 5 lit. Glycare is non selective herbicide and it can be use on active and standing weeds. 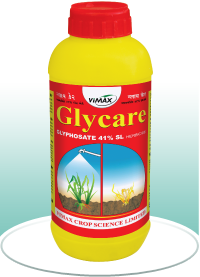 Glycare is systemic herbicide so it translocate in to weeds and eradicate weeds from root level. Glycare control all kind of green vegetation. Glycare is very good for cyperus and cynodon like difficult weeds control. Glycare can be use in standing crop also but be careful do not spraying on main crop for precaution use hood while spraying. Glycare is inactive when it come in contact with soil so it is very safe to environment and soil. Glycare solution on young and green weeds. 250 ml, 500 ml, 1 lit, 5 lit. 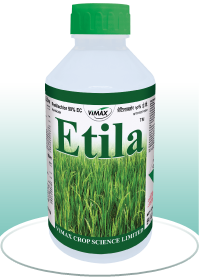 Etila is an pre emergence selective herbicide for paddy. Etila is control broad and narrow leaves weeds of paddy at the time of germination. Etila usage can control weeds up to 30 to 45 days. Etila contains a.i is recommended by all paddy research station. mix it with 30 kg sand and broadcast uniformly on transplanting field. Crezil is non selective contact herbicide. Crezil control very quickly all types of weeds. Crezil works very fast after its application on weeds. Crezil is not easily wash by rain because of their quick penetration power. Crezil is very safe to soil because when it comes in to contact with soil it become inactive so it is very for both water and environment. Crezil better result apply it when weeds become 3 to 4 leaf stage. 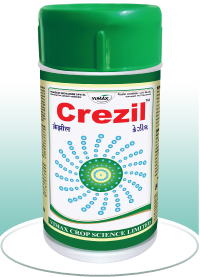 Crezil is best for weed control when it its use in standing crop with the help of hood.